Sijinius: TRUE CHRISTIANITY ALWAYS PROGRESS SOCIETY. ANY COUNTRY WITH MORE CHURCH BUILDINGS THAN COMPANIES IS A “POOR” COUNTRY, NOT PROGRESSING!!! 1. IN A TRUE GATHERING OF BELIEVERS NO ONE IS HUNGRY, HOMELESS, UNEDUCATED, JOBLESS, ETC! In a true church, ALL NEEDS ARE MET. In other words, there is nobody who is hungry, there is nobody who does not have a place to sleep, and so on...regardless of how bad the economy of their resident country is. True Christians strive daily to cater for themselves- not just ''by faith'', but in reality. It is the work of the Pastors and Apostles to ensure that. Any country where companies and warehouses close down and are bought and converted to church buildings is a poor country. Church buildings are economic wastes. And such a country will have many jobless youths as well as church members. 2. YOU BUILD THE TRUE CHURCH- BELIEVERS, NOT PHYSICAL BUILDINGS! You don't go about building church auditoriums if there is at least one person who does not have a place of abode. Why do you think God was angry at Israelites in Haggai 1: 1-4? Was it just because the temple was not built? No! God was angry because they all had beautiful houses, and neglected to build his temple. You do not put the cart before the horse. You, settle every member's housing needs and see if you won't have an auditorium eventually. BUT EVEN TRUE CHRISTIANITY IS NOT ABOUT TEMPLES, SYNAGOGUES, AND EDIFICES. The Christian is the temple of God and that was why the early Christians met in their homes. The Churches warned in Revelation 2-3 were all in (present-day) Turkey. 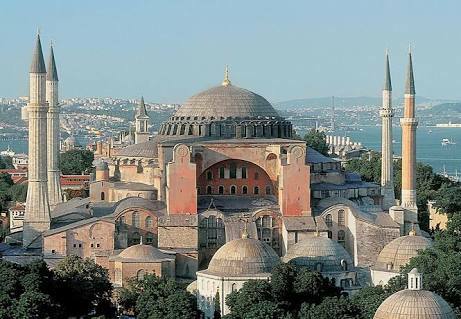 The largest cathedral in Turkey (Hagia Sophia) first became a mosque and is now a museum. Some church buildings in China, UK, USA, etc which have not become relics have either been converted to mosques or to museums. In Nigeria too, you can clearly see that pattern- beautiful structures erected as churches, and many warehouses/companies have been turned to church buildings. Such a country will definitely be in poverty with many poor church members because they now have "politicians" as pastors! 3. THE CHURCH EDUCATES BELIEVERS FIRST, NOT UNBELIEVERS. A church should never build a school that is absolutely unaffordable/unattainable for the believers there, whereby it is unbelievers who ''can afford it''. It is an anathema to true Christianity unless of course, the school is not the denomination's. You don't have “billionaires” in the church while some believers are hungry, jobless or homeless...unless you have ''politicians'', not pastors in charge. True Christians are not materialistic or trusting of their riches. They submit to God. 1 Tim 6: 17-19, Acts 4: 32-37, Acts 5: 1-11. This was exactly what God proposed for the Jewish nation and it reflected/still reflects in Jews worldwide. IT WAS ALMOST IMPOSSIBLE TO FIND A POOR/ENSLAVED/UNEDUCATED JEW- they took care of their own, and still do today in Judaism. However, Christians are now the spiritual people of God and that covenant has passed over to them. So, why do Christians today care more about denominations -the politics, business and doctrines of division- than about Christ and the true church i.e Believers?! 4. GOD DOES NOT MEASURE BEING ''RICH'' BY EARTHLY MATERIALS ACQUIRED. I see a brand of Christianity that measures wealth strictly by materialism. Those are the kind of people whose belly is their god and whose God is mammon. Phil 3: 19-20. A truly rich person is prosperous. True prosperity is not having stock portfolios, mansions around the globe, wife and girlfriends, a potbelly, etc. True prosperity is having all your needs met, in good health. Christians are prosperous because God, their father, meets their needs ALL THE TIME. Matt 6:8, 7: 11, 3 Jn: 2. Even wealthy countries of the world understand that it is not materialism or mineral resources that make you rich, it is building a visionary system around the attitude and culture of hard work, accountability, merit and justice- whether or not you believe in God. Nature is governed by laws and Christians are not exempted. All through history, Christianity imparts societies positively. In fact, it was Christianity that influenced the welfare programs of developed countries. All developed countries that take care of every single citizen were either influenced by true Christians or they had Christians in government at some point in their history. True Christians love everyone equally and act right because they are righteous. And they do good to all, particularly those of the household of faith. Gal 6:10. Both riches and poverty can cause sin. Poverty particularly makes people desperate, not necessarily godly. The fact that you have many church-going people in a country does not make them a righteous nation of God-loving people. When people truly know God and do his will, they will be prosperous and comfortable. It is the work of their prophets and teachers to ensure they don’t forget or abandon God, instead knowing more of him. Putting people in poverty as a means to keeping them in tow is not only wicked, it is purely devilish. The Pastor is a gift to the body of Christ who takes care of EVERY SINGLE MEMBER. A Deacon/Bishop is any Christian who aspires to lead a church of Christ (1 Tim 3:1). If you are not called and/or ready to do that, you have no business opening or leading a building/branch/parish/denomination which you call church! If you have accepted Christ as your lord and savior, you are a Christian and should behave Christ-like. Love God with everything you’ve got, everything you are; love your neighbor as yourself. True Christians do not give God 10%- whether money, salary, time, heart or anything for that matter. True Christians give God 100% because he is their Lord, he owns all of it. Any doctrine that teaches Christians to only give God 10% (of their time/money/life) ''because he commands it'' is ignorant at best, or deceptively evil at worst. God bless you as you move this country forward by being a true Christian.